It’s always the films that you expect to do nothing that surprise you. I went in fearing the worst (my usual stance these days) and was rewarded. This time it’s with a hard boiled, gritty Deep Southern revenge flick. That being said, it’s not without its flaws but worth a watch. Just has enough to stay afloat among the swamp of bottomless flops that have flooded our local cinemas. At its best, it mixes the darkly comical moments of No Country of Old Men with a splash of Dead Man’s Shoes. At its worst, you can’t help but feel I could be watching either of those two films instead. 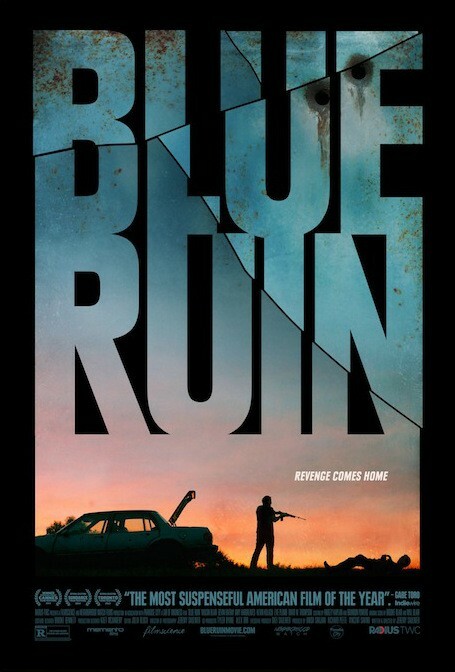 Here we follow Macon Blair as a mysterious hobo wandering the desolate harbour, salvaging scraps from bins and seeking shelter in a battered up blue car. It makes for an intriguing, if slow, opening as all the usual questions pop up; why is he in this state? What happened? The general point of a film. However, his strange and sheltered existence is soon turned upside down as he returns to his childhood home to carry out an act of vengeance. Proving himself an amateur assassin, he winds up in a brutal fight to protect his estranged family. I won’t divulge too much and spoil the story as I have tended to do when I rant. This is hardly a film to rant about. Praise, more like. But basically by trying to do what’s right, our hero inevitably puts himself in even more trouble by upsetting a nasty family deep South. His transition from a hapless hobo to a calculated killer is very well done and well acted. Blair is a likeable lead, even if his character is a little strange. A stumbling nervous individual. His initial first kill came as a shock because you honestly thought he wasn’t going to do it or balls it up, which he nearly did. At times, it does make for infuriating viewing because at times his character makes so many stupid decisions that you are practically (well literally in my case) yelling at the screen; “Don’t do that!”, “Pick the weapon up”, “Don’t go in that room”. Yadda, yadda, yadda. Unfortunately, at times the film is left to Blair a little too much and his character doesn’t have enough charisma to carry it in parts. The supporting cast are limited and bar a few exceptions are hardly memorable. When Blair is on the run or staking out his hunters, the suspense is executed perfectly. A brilliant scene in which Blair hides out in his sister’s home for his supposed captors is fantastic and nail-bitingly tense. It almost became a a dark take on Home Alone. An opportunity involving Blair and a garden tool was horribly wasted. When Blair finally gets to deal with his estranged sister (Amy Hargreaves – Homeland) does make for good viewing as we get to see a little more into his past. The pair work well together and to be honest, I would have been happy to see more on that side of the story. The actual villains in this piece are very stocky and generic, bar Kevin Kolack who was delightfully snidey and creepy. A nasty addition that was heavily wasted as his counterparts were very weak, stereotypical and . . . weak, mainly. The other stand out performance was Blair’s gun-toting old high school chum Ben (Devin Ratray). Devin Ratray. Ring a bell? No? It’s only Buzz from Home Alone. I kid you not. Couldn’t believe it. A good performance with a darkly comical encounter that broke up the slackening pace. Currently ranks #78 out of 177!